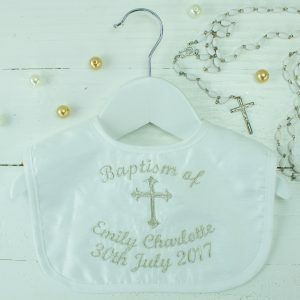 Welcome your little one to the church with our stunning Personalised Christening bib, the perfect keepsake gift to commemorate all of the important information from that memorable day.... available in white or ivory. To personalise, simply fill out all the relevant information boxes below! Welcome your little one to the church with our stunning Personalised Baptism Bib, the perfect keepsake gift to commemorate all of the important information from that memorable day... available in white or ivory. To personalise, simply fill out all the relevant information boxes below! 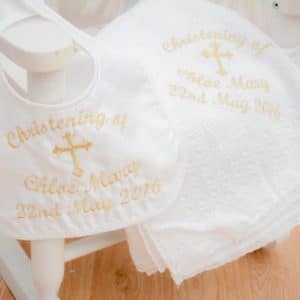 This stylish Personalised Christening/Baptism Gift Set includes both our Personalised Christening/Baptism Shawl & Personalised Christening/Baptism Bib, the ideal premium gift for their special day in Church. You can personalised both of these items free of charge by completing the relevant boxes below! 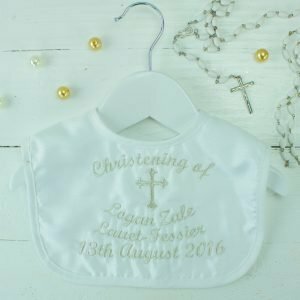 Show how proud you are of becoming a God Parent with our stunning Personalised Godchild bib, crafted from high quality silk and beautifully designed to show the all important details of their big day all in one place. To personalise, simply fill out the relevant text boxes below! 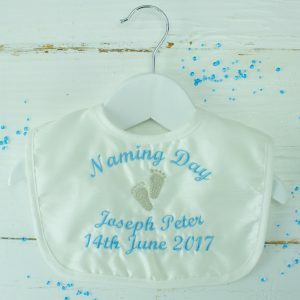 Welcome your little one to the world with our stunning personalised dupion silk bib, the perfect keepsake gift to commemorate all of the important information from that memorable day.